Off shoulder skater style dress with v lined skirt and zipper details. made from a mixture of TS4 textures. Comes in 31 colors. 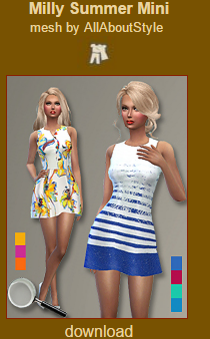 Milly Summer Mini mesh by All About Style is NOT included and is required for this download. Get it here.